In front of some 86,000 fans at the New York Polo grounds World's heavyweight champion Jack Dempsey took on the bull like Luis Angel Firpo in defence of his championship. Firpo was an immensely strong fighter and was possibly as strong as the former World champ James Jeffries, Firpo a bull of a man had come to prominence when he came to America, in actual fact legend has it that Jack Johnson had an exhibition bout with Firpo and easily out boxed the bull like Argentine, Firpo was taller than Dempsey by a couple of inches at 6"3 and was easily the strongest man Jack had faced so far, even much stronger than Willard whom he had stopped in eight rounds to earn this a crack at Dempsey. 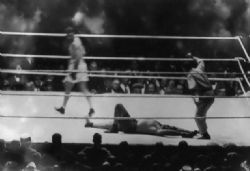 Willard had towered over Jack and had advantages in every department physically, however Dempsey had an equalizer in both fists and this showed in the destruction as such, but Firpo had proved his worth also, before the Willard demolition Firpo won in a space of five months a series of ten fights in a row, eight by KO and two by decision by beating the likes of Jack Mcauliffe, Bill Brennan including the Willard victory amongst others to finally get the title chance against America's favourite son that was Dempsey. On a September evening in 1923 some eighty six thousand fans turned up to see Dempsey defend against the huge man mountain Firpo, who's nickname was fittingly "the wild bull of the pampas" due to his bull like presence in the ring, however though on entering the ring the mostly neutral fans gave Firpo a friendly welcome as he got into the ring in a checkered gown, the champion Dempsey and his challenger got the final instructions from third man Johnny Gallagher before returning to there corners. At the start of the round Jack rushed Firpo as he missed with a left hook, Dempsey almost falling to the canvas as he tried to land in desparation if anything, however both fighters clinched, Firpo tried a big right as Dempsey came in low fighting from a crouch, tying eachother up, Firpo threw a couple of big rights on the inside to Dempsey's head as they the referee parted both sluggers, Jack exploded a left hook to the Argentines chin that sent him to the canvas, Firpo up at three, tried a desperation right hand, before falling into a clinch, Firpo threw some lefts and rights on Dempsey as Jack tied his man up, getting in close and punching away at each other. Dempsey then unleashed three left hooks that sent Firpo down again, up again Firpo was met by the champion as both guys got in another clinch, not surprisingly, soon after Dempsey smashed in five left hooks that floored Firpo a third time, on arising Firpo unloaded a big right as he got in close quarters with Jack as Demspey landed a nice left hook this time to Luis body that sent him tumbling down again this time for a count of eight, it appeared the fight was over, but unbelievably Firpo got up again. Dempsey deposited Firpo to the floor a fifth time with a left hook to the chin, Firpo arose again, exploding a fight ending overhand right on Dempsey, Jack touched down himself for a knockdown, but was soon up as Firpo exploded another right, as both tied each other up in close, Dempsey soon detonated a overhand right hand bomb of his own that dumped Firpo in the corner, not surprisingly Firpo got up again. Dempsey must have been wondering what it was going to take to keep his Argentine challenger on the floor, on getting up Firpo was clipped this time by a short left hook that traveled no more than six inches to his exposed chin that sent him crashing yet again for a seventh visit to the canvas!! !, Firpo was up at around six as Dempsey attacked, Firpo in his defence tried a few big rights, one that did land hurt Dempsey, another right landed to Jack's midsection that backed the champion to the ropes where he let go with bombs from both hands wildly throwing his hayemakers from the bleachers, lefts and rights landed, then two big right hand bombs landed, the second smashing into Dempsey's chin and knocking the champion through the ropes out of the ring onto the gentleman of the press. Referee Johnny Gallagher tolled the fatal ten as Dempsey was, so legend has it pushed back into the ring by members of the press and not by himself, Dempsey scrambled through the ropes and had just got up before the fatal "ten", Dempsey was met by an onrushing bull that backed Jack to the ropes with more big left and right hand bombs as Dempsey still shaken survived the onslaught coming his way and claimed his man, holding onto him for dear life, Firpo however looked to end it there and then missing with a right uppercut followed by a succesion of right hands, one of which landed on the back of Dempsey's neck, however the champion turned his challenger nicely just before what must be considered as one of the most exciting rounds in boxing history in a total of nine knockdowns, seven to Dempsey and two to Firpo, the pace was unbelievable. Dempsey won the round, but it was Firpo who was coming on strong towards the end of that round after being floored several times, the second was no different from the start of the first as Dempsey trying to gain a psychological edge went straight at the Argentine bull, landing a nice left hook on the challenger just before they got in close into a clinch, Dempsey soon missed with a left hook as Firpo backed off, as Dempsey coming forward let go with both hands, landing a huge left hook on the Argentine, that seemed to have a delayed reaction on Firpo who was pushed to the floor by Dempsey, however it was visible that it was the left hook bomb that was the cause of the knockdown as Firpo was taking a count before arising, obviously hurt but as game as any man alive Firpo arose again!!!! !, and threw a sloppy fight ending right out of sheer desparation. Dempsey countered with a uppercut before falling into another clinch, before Dempsey let go with a left hook and smashing right to Firpo's chin that sent the big South American down on his back, it did'nt look like Firpo was getting up as the count reached five Firpo rolled onto his belly and could'nt get up, six, seven, eight, nine, ten, Firpo was counted out and Jack Dempsey had retained his World heavyweight championship in one of the most unbelievable fights ever. Dempsey ever the gentleman and fine sportsman helped Firpo to his feet, as Firpo looked like he wanted to continue fighting, despite being in no such condition to do so, and was promptly led back to his corner by his handlers, in less than almost two rounds of boxing eleven knockdowns had been scored, nine by Dempsey and two by Firpo, amazingly there was no rematch although Dempsey had proved he was the better man, I think it would have been some spectacle indeed. Firpo would go back to Argentina and back into relative obscurity as Dempsey would not fight for another three years, getting into the film business with wife and actress Estelle Taylor, many claimed those years inactive ruined Dempsey the fighter, and when he did return he would go onto to lose his championship to Gene Tunney, however with the kind of victory scored on that fateful night in September twenty three of twenty three, Dempsey etched his name into the record books as not only the World's heavyweight champ but one of the greatest men to hold that particular distinction in doing so. Later in life the great Rocky Marciano met Firpo, in a famous photo Firpo holds his fabled right to the rocks head, which is almost the size of Marciano's head, Marciano wondered how Dempsey could have survived being hit on the chin with such a huge ham, Firpo must have wondered also! such a fight will go down as one of the divisions classics and despite never challenging again for the title, Firpo carved his own niche that September night at the Polo grounds along with Dempsey in the history of the heavyweight championship of the World.